BANGKOK (UCAN) — Ha Noi Catholics are upset at government authorities for planning to try eight lay Catholics involved in local Church-government land disputes on the same day an auxiliary bishop is to be ordained for the archdiocese. 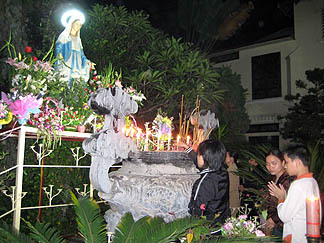 Catholics pray in front of the Marian statue in Ha Noi’s Thai Ha Church on Nov. 24, Feast of the Vietnamese Martyrs. They prayed for the return of local Church properties, justice and peace and eight Catholics who will be on trial on Dec 5. Ha Noi city’s Dong Da District Court “informed us that eight Catholics will go on trial Dec. 5 at the headquarters of the People’s Committee of O Cho Dua ward, one kilometer away from our church,” Redemptorist Father Pierre Nguyen Van Khai told UCA News on Nov. 24. Father Khai works at Redemptorist-run Thai Ha parish, where hundreds of Catholics occupied a former plot of Church land near the parish church on Aug. 15, feast of the Assumption. They put crosses and Marian statues at the plot, which the government confiscated in the early 1960’s. The district court issued its summons Nov. 21 to four men and four women, who range in age from 21 to 63. One of the four, Marie Nguyen Thi Nhi, an ethnic Muong woman, was arrested on Aug. 28 after she and other Muong Catholics played gongs and prayed at the site. The government is charging her with causing social disturbance. It has accused the others, all from the capital, of damaging public property and causing social disturbance. A local Church source told UCA News on Nov. 25 that Nhi, who is from Hoa Binh province, and Ngo Thi Dung have been kept in Hoa Lo prison in the capital while others are under house arrest. “Local Redemptorists and Catholics feel tense and angry at the court, who decided to try those innocent Catholics on Dec. 5, when our auxiliary bishop-elect Laurence Chu Van Minh of Ha Noi is scheduled to be ordained,” Father Khai said. The government might want to cause difficulties for the local Church, knowing many Catholics want to attend the ordination, but authorities also might be afraid of many Catholics attending the trial, he suggested. The priest revealed that the parish is asking lawyers for the accused to work with court officials to reschedule the trial on another day. Vinh said the eight accused are innocent, so fellow Catholics will gather at churches throughout the country to pray for the defendants to get a fair trial. Father Khai, 38, expects the defendants will receive prison terms of up to three years, which “would disappoint us because they did not break the laws.” The damage which the government claims seven of the accused Catholics caused to the wall around the controversial plot of land was reportedly estimated at only 3.7 million dong (US$218). The government later destroyed the wall and built a flower garden on the site in October. The Redemptorist priest reported court officials said they will allow local Catholics and priests including Redemptorists to attend the trial, but they will have to present their personal identity cards to security officials. He hopes many people will attend the hearing. 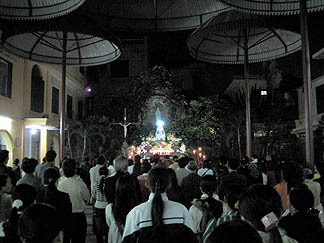 On the evening of Nov. 24, the feast of the Vietnamese Martyrs, 2,000 Catholics attended a special Mass at Thai Ha church. They prayed for the return of Church properties, for justice and peace, and for the Catholic victims. After Mass, they marched to the Marian statue in the compound, placed candles at the statue, offered incense and sang hymns. Some women told UCA News they were sad to hear their fellow Catholics would be tried unjustly. “We can do nothing but pray to God for them to be free,” one of them noted. They said they love the local Redemptorists, whom they described as looking pale and haggard after struggling for justice and peace, and preventing gangsters supported by police from threatening Religious and attacking parish properties at night.